For the winter I am totally crushing on velvet. It brings a rich, luxurious vibe to a look and is perfect for adding texture to an otherwise simple outfit like this. Paired with my new cap-toe heels that I have been on the hunt for for-ev-er, leopard clutch and a few sparkling accessories- I am definitely feeling winter-chic. Next on my list: velvet blazer. Are you loving velvet? If so, how are you wearing it? Thanks love! Miss you!! Get together SOON! THANK YOU TERRY! :-) Hope you are having a great day! Pretty- velvet in rich hues are one of my fave materials this time of year. Love the fresh take with the white blazer! Have you entered my ShopSeptember giveaway yet?? Love this outfit on you! That Royal Purple is so rich. Oh that minkoff...yes please! Happy New Year babe! You going to IFB this Feb? Ohh velvet is such a luxurious material, haha! I love your cap-toe shoes as well! I have been on the hunt for a velvet blazer too. I used to have one years ago, and let it go. Kinda kicking myself now. And those shoes are lovely! Oooh! That velvet! Lovin' this look! Okay, I totally want velvet leggings. But that's a BRAVE look :) even for me! Love the shoes and the necklace. Congratulations on your new job at Posh Mark! 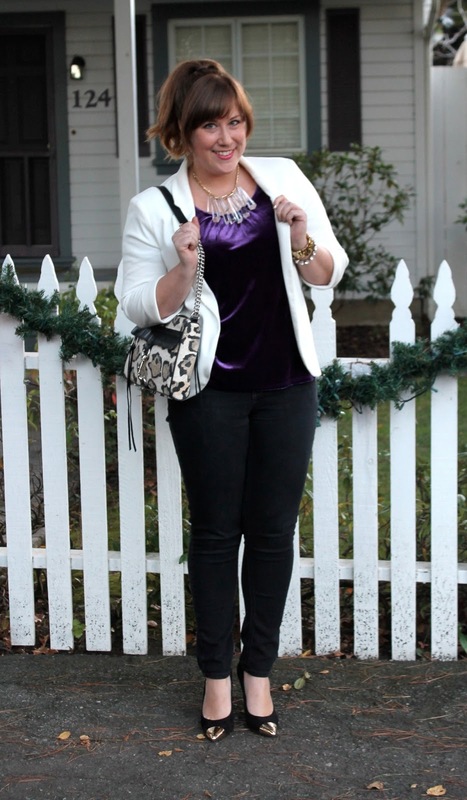 I love the velvet with the white blazer! Very cool!! Check my latest post when u have time! What a fun Poshmark find! I love that necklace!! And love the velvet! Such a cute look, lady!